Madison, WI – When you think of a family of four, who do you picture? To some, that means two parents and two children. But for a growing number of young ones in our community, that picture is dramatically different. Picture a family where the most stable member is a 15-year-old high school student taking care of three younger siblings and wondering how to make the holiday season bright for their family. 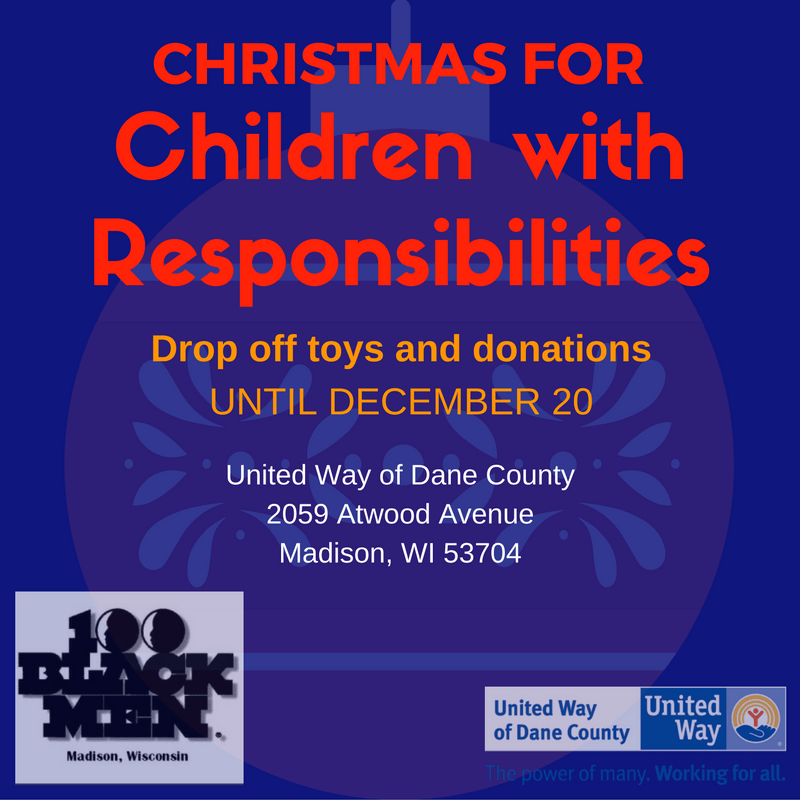 100 Black Men of Madison, in cooperation with United Way of Dane County, wants to ease this stress with the Christmas for Children with Responsibilities Toy and Donation Drive. This donation drive is collecting toys and gift cards for young adults who are the head of their family. You can make their holiday season brighter with a gift that will go to the youngest members of these families. Drop off donations from now until December 20th during business hours at United Way of Dane County, 2059 Atwood Avenue, Madison. Gifts will go to students enrolled at Madison Metropolitan School District and will be given out on December 21st. 100 Black Men of Madison and United Way of Dane County would like to thank the community in advance for their incredible generosity this holiday season. For more information, please call United Way’s Volunteer Center at 608-246-4380.